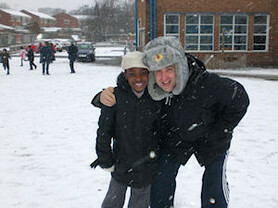 Snow day was the best thing I've ever experienced in my life! 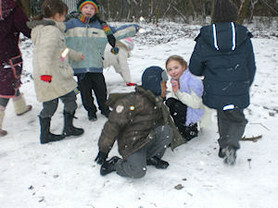 We were all making snowballs and chucking them at each other, it was amazingly amazing! 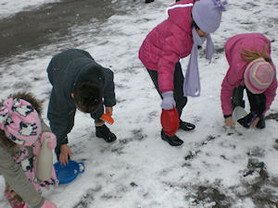 On the platform in the playground, there was a slippery part, and we were all sliding down on it, mostly landing on our bottoms and on our backs, tumbling over each other. 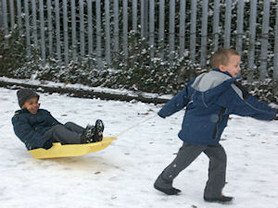 Mrs Christie brought out a toboggan and some people were having a ride (cool!). The whole day was great, and I'd love to do it again! Ready to make some snowballs. It's all 'smiles' despite the cold. Having lots of fun in the snow.